Adda52 is all geared up to host National Poker Championship 2019 – a unique opportunity for poker fanatics from all over India to compete against each other for the title and the gigantic 1 Crore GTD prize pool. NPC will take place on the website from 4th April to 7th April 2019. 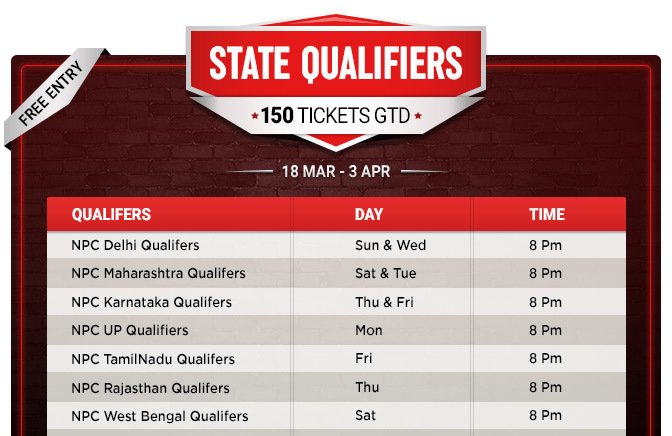 It’s your chance to become India’s first National Poker Champion! You can play the championshipevent on any or all starting Days (1A/B/C). Each starting day will begin with 15,000 stack at 25/50 starting blinds & each level of 10 minutes. Game will be paused at a designated level (TBD) on each starting day. All survivors of Day 1A/B/C will be registered for the NPC Final Day on 7th April starting 5 PM. If you play on more than one starting days (1A/B/C), you largest of all stacks will be considered for the Final day. Starting Blind level of the Final Day will be reset in order to keep 35BB Average Stack. Final Prize pool & payout distribution will be declared on Final Day of the tournament. 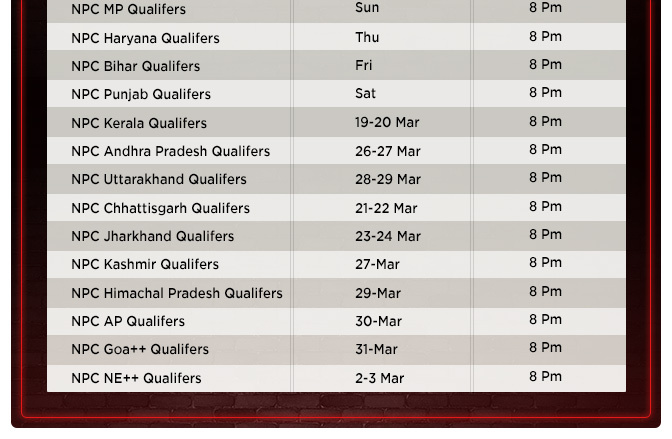 Any player who has played 1 or more cash games on Adda52 after 1st February 2019 will get an NPC Free Entry Qualifier ticket for the state he lives in. Adda52 is organizing Free State Qualifiers for 29 Indian states. What if you don’t make it through the Qualifiers? 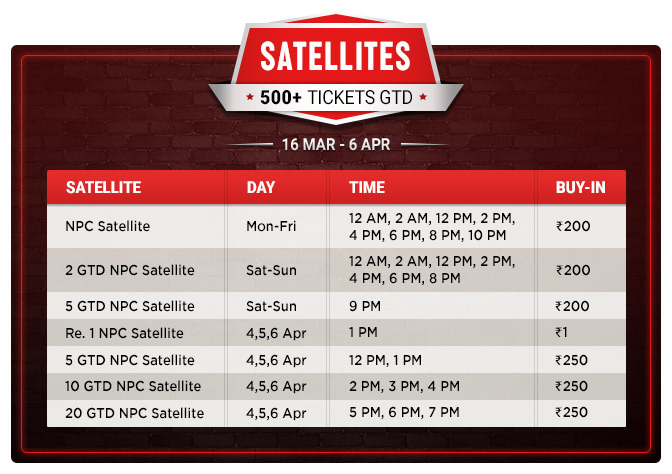 Join NPC satellites with buy-ins ranging from INR 1 to INR 250 to claim your seat to the Championship. The satellites will be held daily on the website and going to award over 500 tickets guaranteed. Qualifiers/Satellite winners can play on any of the starting Days 1A/B/C on 4th, 5th & 6th April respectively. 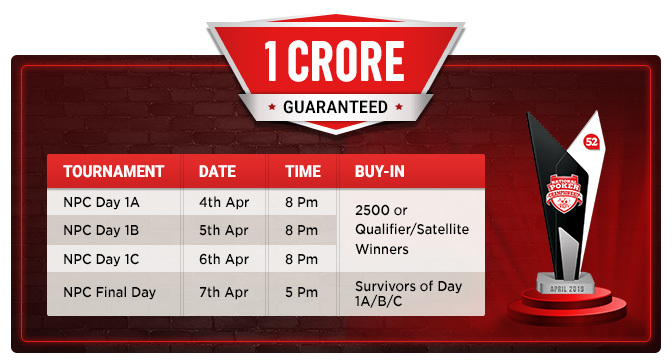 If the Qualifiers/Satellite winner doesn’t register on Day 1 or B, he/she will be auto-registered on Day 1 C.
Any unused satellite/qualifiers winning ticket can’t be refunded. By participating in the tournament, the Winner consents to providing his image, interview, etc. to be used as promotional content by Adda52 and its media partners. You can download Adda52 app from the website and install it on your Android or iOS devices to play your favorite poker games anytime and from anywhere.